Topological transport of light is the photonic analog of topological electron flow in certain semiconductors. In the electron case, the current flows around the edge of the material but not through the bulk. It is “topological” in that even if electrons encounter impurities in the material the electrons will continue to flow without losing energy. In this work, light flows not through and around a regular material but in a meta-material consisting of an array of tiny glass loops fabricated on a silicon substrate. 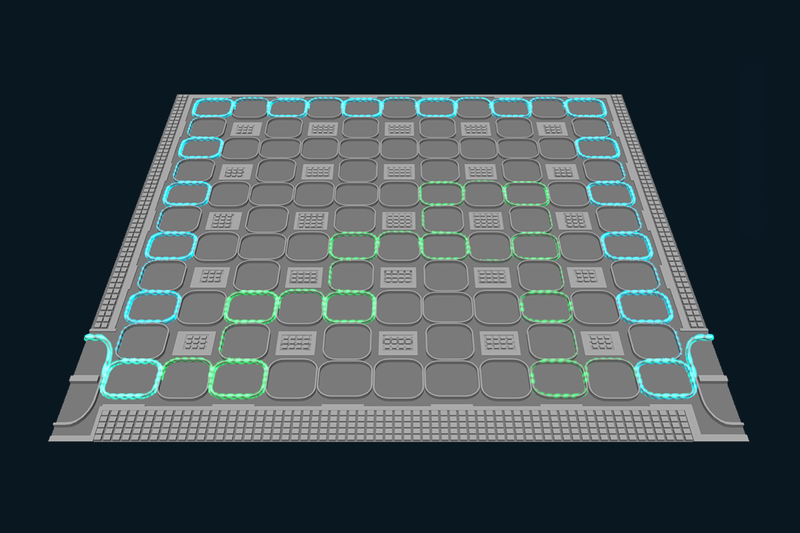 If the loops are engineered just right, the topological feature appears: light sent into the array easily circulates around the edge with very little energy loss (even if some of the loops aren’t working) while light taking an interior route (bulk-route) suffers loss. PFC-supported scientists have made detailed measurements of the transmission (how much energy is lost) and delay for edge-state light and for bulk-route light in this system. Reporting trials with numerous array samples, they reveal that for light taking the bulk (interior) route in the array, the delay and transmission of light can vary a lot, whereas for light making the edge route, the amount of energy loss is regularly less and the time delay for signals more consistent. Robustness and consistency are vital if you want to integrate such arrays into photonic schemes for processing quantum information. Microchip manufacturing is not a perfect process, and irregularities in fabrication can result in device-to-device performance variations, which usually undercut microchip performance. With topological protection (photons traveling at the edge of the array are practically invulnerable to impurities) at work, consistency is greatly strengthened. Apart from the potential photonic chip applications of this scheme, this platform could also be used to investigate fundamental quantum transport properties.